This recovery is an excellent example of using components from two traditional recovery techniques and combining them to create a new one. 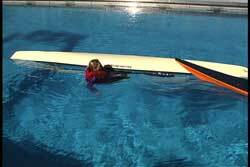 A wet re-entry is commonly used with a roll or a paddle float roll. 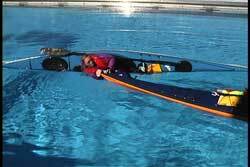 The bow assist is commonly used for those who remain in their kayak after capsizing. However, if you put them together you end up with a recovery technique that may be easier for those who have difficulty climbing onto a back deck for re-entry. 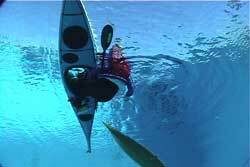 (As a side note, I am sure other kayakers have done this before, but it is not seen in the main stream. I wish I could take credit for it, but my wife Hadley was the one who put it together.) Hadley volunteered to do it for the video having never attempted it before. She said she loved it, because it was easier than climbing back up on her boat. We now call it the Hadley Combo around the Horodowich household. 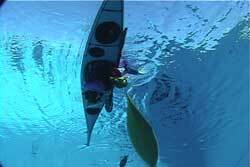 If you are a paddler and you dislike climbing on the back of your kayak as your re-entry method, then this combination could work for you if you don't mind going underwater for a few seconds. You will need a pump if you use this recovery technique. In addition, using nose clips makes this a more comfortable experience. Nose clips increase breath holding, because it reduces the discomfort of water going up your nose. As with any technique there are pros and cons. I would not recommend this technique in very cold waters unless you have a hood on your head. 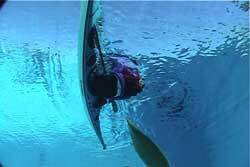 Also, be careful with any form of bow assists in rough conditions because the kayaks can bang into each other. 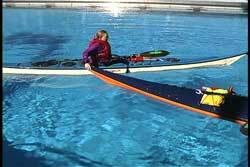 In order to use both hands you will have to reach underwater with the hand that was farthest away from the kayak. That outside hand is reaching so it can grab the opposite side of the cockpit coaming. The hand nearest the coaming is actually lifting the coaming and putting the kayak partially on its side, which makes it easier to grab the other side of the coaming. You keep your paddle between your body and the kayak. When you grab the coaming edge closest to you be sure the paddle is between you body and your arm. 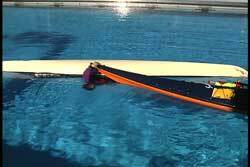 This way your paddle will come up with you, as you roll yourself up, once you have your partner's bow. Some choose to hold the paddle shaft and the coaming while doing this skill. When you feel the bow in your hands I recommend you pull yourself up and rest your head on the bow and take a breath. Once you have collected your thoughts, taken some breaths and reoriented yourself, you can come up the rest of the way. 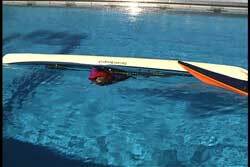 With both hands on the bow flip the boat upright using your knees and legs. Then lift your head until you are upright. See USK article, "Hip Snap." When rafted up you and your partner can pump the water out of your cockpit before going on your merry way. Whether you pump with your skirt covering the cockpit opening or not will be up to the water conditions. I always find it interesting that many basic classes only teach with one person pumping during assisted recoveries. If there is a third paddler they can also come along side to help pump. 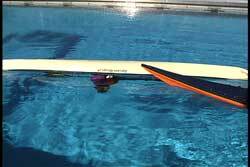 It doesn't take very long to pump out a kayak that has two bulkheads if there are two or three pumping simultaneously.